BÉGIN, LOUIS-NAZAIRE, Roman Catholic priest, professor, author, archbishop, and cardinal; b. 10 Jan. 1840 in Lévis, Lower Canada, son of Charles Bégin, a farmer, and Luce Paradis, a cousin of Bishop Ignace Bourget*; d. 18 July 1925 at Quebec. The sixth of ten children, Louis-Nazaire Bégin attended the model school in Lévis in 1855 and the Collège Industriel de Saint-Michel (in Saint-Michel-de-Bellechasse) in 1856. In 1862 he received the degree of baccalauréat ès arts from the Petit Séminaire de Québec, where he had been a student since 1857, and he was the first to be awarded the Prince of Wales Prize, instituted by the future monarch during his visit to North America two years earlier. Bégin enrolled in the Grand Séminaire de Québec in 1862, but after a year there, the superior, Elzéar-Alexandre Taschereau*, who was also rector of the Université Laval, sent him to Rome to study at the Roman College (Pontifical Gregorian University), along with the brothers Louis-Honoré and Benjamin* Pâquet. Taschereau, who had earned his doctorate there in 1856, designed a study program for them, in the expectation that they would form the core of the faculty of theology at Laval, which was to be fully organized in 1866. The three students took advantage of their stay to forge strong ties with, among others, Henri Brichet, Zefferino Zitelli, and Giovanni Pierantozzi. These men would all later hold office in the Sacred Congregation of Propaganda, the body within the Holy See that was responsible for Canada, and their assistance would be invaluable in future struggles. The long summer holidays gave the young cleric an exceptional opportunity to visit other countries in western Europe. On 10 June 1865 he was ordained to the priesthood by Costantino Cardinal Patrizi in the basilica of St John Lateran. 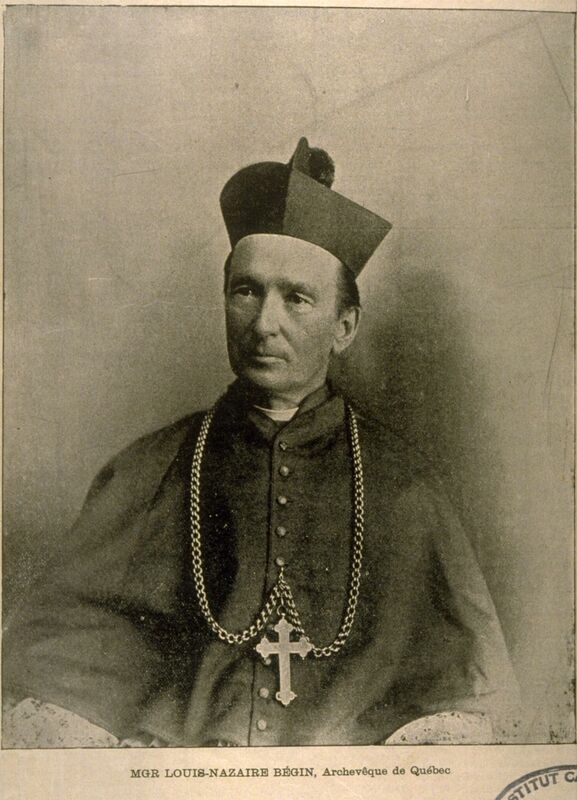 After obtaining his doctorate in canon law in 1866, Bégin spent another two years abroad. To further his historical and linguistic knowledge, he enrolled first in the University of Innsbruck in Austria. While there, he placed orders on behalf of the Séminaire de Québec for reproductions of famous works of art by Tyrolean artists. He then spent four months in Palestine and also visited Egypt, where he collected archaeological objects for one of the museums in the Université Laval. Although he was far away, he kept abreast of developments at home and approved of Taschereau’s decision to dismiss professors who supported the ideas of Mgr Jean-Joseph Gaume on the replacement of pagan authors by Christian ones in the college curriculum. During his teaching career at the Université Laval, which began upon his return home in July 1868, Bégin gave courses in dogmatic theology, Holy Scripture, and church history. 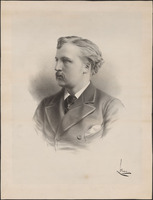 From 1871 to 1884 he was closely associated with the university administration through the various offices he held, including those of member of the university council, prefect of studies at the Petit Séminaire, and director of both the Petit Séminaire and the Grand Séminaire. During this eventful period of his life he delivered many public lectures of a historical or literary nature, and published a series of works on apologetics and popular theology. His delicate health was severely taxed by these endeavours and he was obliged to take occasional periods of rest. Bégin’s scholarly work achieved recognition, nonetheless. In 1882 the governor general, the Marquess of Lorne [Campbell*], invited him to be a charter member of the Royal Society of Canada [see Sir John William Dawson*]. Bégin belonged to section i, which was devoted to history, archaeology, and French literature and he would serve as its president in 1908. Lorne also wanted this section to safeguard the purity of the French language, an objective Bégin took seriously. His increasingly heavy administrative and pastoral duties led him on several occasions to submit his resignation to the society, which invariably refused to accept it, being only too glad to count among its members a prelate who was clearly destined to become a prince of the church. In 1915 the society would publish in its Proceedings and Transactions (Ottawa) the lecture he delivered that year on church-state relations. Around 1882 Bégin also entered the Academy of Arcadia in Rome, a literary society founded in 1690. The academy, which had lost some of its lustre during the 19th century, was made up mainly of Roman nobles and people from outside Italy. During the crisis that rocked the church in the province of Quebec towards the end of the 19th century, Bégin enjoyed the ever-increasing confidence of Taschereau, who had been named archbishop of Quebec on 24 Dec. 1870. 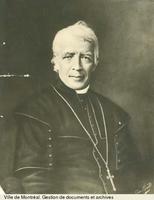 He gave the archbishop his unqualified support in a series of disputes with Bishop Ignace Bourget of Montreal and Bishop Louis-François Laflèche* of Trois-Rivières. 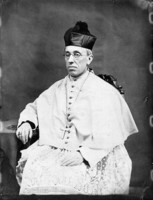 Nevertheless, observers with as widely divergent points of view as Bishop George Conroy* and Abbé Joseph-Gauthier-Henri Smeulders, two special envoys from the Holy See, concurred that the lower clergy largely shared the views of the Montreal–Trois-Rivières group. The ideological tension that marked Pius IX’s pontificate and contemporary Catholicism transformed what was essentially a conflict of interest into political and doctrinal confrontation. There was, however, one basic principle on which the protagonists were divided: the degree of autonomy that should be enjoyed by the Canadian church, its leaders, and its members, in relation to state structures dominated since 1867 by English-speaking Protestants. This question took on an important nationalist dimension. In any event, the Montreal–Trois-Rivières group was accused by their ecclesiastical and lay opponents of political interference because they publicly attacked the Catholic political elite for its perceived inability to defend the interests it represented. One of the main disputes concerned the founding of a French-language university in Montreal, and, specifically, the control of faculty appointments. Bourget wanted to name candidates who shared his views, whereas the Séminaire de Québec would not countenance the existence of a rival seat of Catholic learning. In 1876 Rome issued a decree recommending that a branch of the Université Laval be established in Montreal, rather than an independent university. Bourget resigned soon afterwards. The following year Rome sent Conroy as an apostolic delegate and his mission in part was to set up the branch on terms largely acceptable to the Université Laval. He failed to reconcile the widely divergent interests and the arrangement he in the end reached displeased people in Montreal. After Bourget’s departure, it fell to Laflèche to uphold the interests of those whom the apostolic delegate had excluded from the branch of the university. Tempers flared. Bégin denounced the narrow-mindedness, ignorance, and bad faith of Laflèche, whom he perceived as the source of all the trouble. “This would be a good time to squash him,” he confided to a friend on 25 Jan. 1883. As director of the Grand Séminaire, Bégin wanted to close the branch in order to teach the disaffected Montrealers a well-deserved lesson. Taschereau, for his part, embraced a proposal (formulated in 1870 by some priests from Nicolet) to divide the diocese of Trois-Rivières [see Calixte Marquis*] and thus put an end to Laflèche’s obstructionism. This request gained the support of a majority of bishops in the ecclesiastical province of Quebec, who in 1883 submitted, at Rome’s request, the names of three priests as candidates to head the future diocese of Nicolet, with Bégin at the top of the list. Taschereau threw all his weight behind Bégin’s candidacy, but failed to achieve his objective. In October 1883, with Taschereau threatening to excommunicate those who opposed Conroy’s arrangement, the Holy See sent a second representative, Smeulders, to promote an agreement that would still be favourable to the Séminaire de Québec. Taschereau decided, however, to short-circuit the apostolic commissioner, fearing that the opposition might succeed in winning him over. In 1884 he and Bégin left for Rome, where together they spent eight months making the most of the connections they had built up over the years with Father Brichet, Monsignor Zitelli, Bishop Ignazio Persico, and Edward Henry Cardinal Howard of England. At first, they were successful, but with the erection in 1886 of the ecclesiastical province of Montreal, and the publication in 1889 of the papal bull Jamdudum conferring greater autonomy on the Montreal branch of the Université Laval [see Édouard-Charles Fabre*], a balance that had been temporarily disturbed was restored. Shortly after returning from the Eternal City, Taschereau had submitted Bégin’s name for the position of principal of the École Normale Laval at Quebec, made vacant by the death of Abbé Pierre Lagacé. The province’s Council of Public Instruction ratified the proposal in January 1885, despite the strong opposition of Bishop Laflèche and Bishop Jean Langevin* of Rimouski, who falsely accused Bégin of sympathizing with secularists because of his friendship with Liberals such as François Langelier*. Bégin’s new position made it necessary for him to end his association with the Séminaire de Québec. His initial priority was the survival of the École Normale, since the provincial government wanted to put teacher training in the hands of the classical colleges, a move Laflèche enthusiastically supported. But Bégin succeeded in winning over a majority of bishops on the Council of Public Instruction. During his term as principal, he found time to publish a textbook on the teaching of Canadian history, which would go through several editions. At Taschereau’s request, he also wrote a new catechism, which was approved by the bishops in 1888. This manual would not be replaced until 1951. 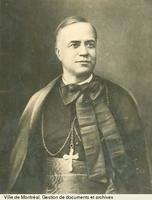 The sudden death of Bishop Dominique Racine* of Chicoutimi in January 1888 opened the way to the episcopacy for Bégin. The clergy of Chicoutimi opposed the appointment of an outsider, however, and they won the support of Laflèche. On four occasions Taschereau urged Rome to appoint his candidate, and Bégin was finally consecrated bishop of Chicoutimi on 28 October in the basilica of Notre-Dame at Quebec. At the time of his consecration, the diocese, which had been erected ten years earlier, had 71,000 members, almost all of whom engaged in farming or forestry. The homogeneous character of the population was a source of pride for Bégin. In his report on the state of the diocese, dated 22 Feb. 1890, he informed the Holy See that in Chicoutimi “there are no unbelievers, no ungodly [or] indifferent persons, no supporters of freemasonry . . . everyone practises the Catholic religion.” He also boasted of the fact that his clergy stood aloof from the politico-religious struggles then threatening to unleash “a racial and religious war” in Canada. The bishop pursued three main objectives in Chicoutimi. First, he strengthened clerical education. He himself took over the direction of the diocesan seminary, taught courses there, and, in order to create a competent professoriate, assumed the expenses of the most talented students who went to study in Rome. Thanks to these efforts, the Grand Séminaire de Chicoutimi gained affiliation to the Université Laval in 1890. Secondly, the bishop’s residence, the seminary, and the cathedral underwent substantial renovations. Finally, in order to further his people’s spiritual well-being, he erected seven new parishes, supported the cause of temperance, and oversaw the development of three devotional societies: the Association des Familles, the Garde d’Honneur du Sacré-Cœur de Jésus, and the Congrégation des Dames de Sainte-Anne. In 1891 Bégin gave his approval for the establishment in Baie-Saint-Paul of a teaching community, which would be called the Little Franciscans of Mary [see Marie Bibeau]. He encouraged the establishment of the Trappists in Mistassini [see Pierre Oger*] the following year. Chicoutimi was, however, only a brief phase in Bégin’s career. In May 1891 Taschereau was already urging the Sacred Congregation of Propaganda to make him his coadjutor, a request supported by the clergy of the archdiocese. 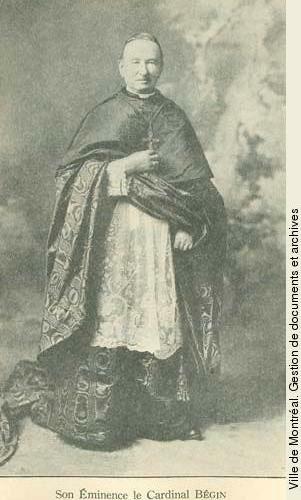 Named archbishop of Cyrene and coadjutor of Quebec in December, Bégin would also serve as administrator sede vacante of the diocese of Chicoutimi until May 1892. On 12 Jan. 1892 he unburdened his soul to a friend: “Quebec terrifies me . . . I dread . . . the many and difficult matters [to be dealt with]. There is neither rest nor respite.” Indeed, the archdiocese contained at that time twice as many parishes and five times as many parishioners as the diocese he had reluctantly left. In 1891 the provincial capital had a population of 63,000 (as opposed to 2,300 in the town of Chicoutimi), and it would double over the next 40 years. Industry, especially the manufacture of footwear, as well as rail transport and shipping, formed the core of working-class life. Despite a constant decline in the number of its English-speaking and Protestant inhabitants, the city of Quebec was still subject to external influences, a result of its activity as a port and the large number of immigrants it took in. Bégin was granted right of succession to the see of Quebec on 22 March 1892. 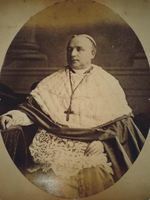 With Taschereau’s mental and physical health rapidly deteriorating, the coadjutor took over complete control of the archdiocese more than a year before Rome formally conferred it on him on 3 Sept. 1894. On Cardinal Taschereau’s death on 12 April 1898, Bégin would automatically succeed him. The new archbishop of Quebec would be a more skilful ecclesiastical leader than his predecessor. Although the two prelates shared a taste for things of the spirit, and their advanced studies set them apart from the other bishops in the province, their personalities were very different. Taschereau had the reputation of being cold, reserved, and taciturn; Bégin was known for his warmth, sociability, and spontaneity. Contemporary observers agree that Cardinal Taschereau was tormented by indecision and readily let himself be influenced by his entourage. Bégin’s actions, on the other hand, would be marked by good judgement and firmness. 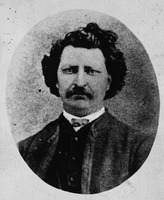 The French Canadian church had great need of Bégin’s talents, for it was being called to play an important role in the tensions troubling Canada, which had been mounting since the execution of Louis Riel* in 1885. What was at issue in these conflicts was the place French Canadians would occupy in confederation. One of the major questions had to do with the religious and linguistic status of Catholic and French-speaking minorities. The Anglo-Protestant majority wanted to build an essentially British country by means of English-language common schools. With the Holy See’s division of the ecclesiastical province of Quebec in 1886 and the renewal of the episcopate at the end of the 19th century, the French Canadian church was slowly regaining its unity. It was, nonetheless, weak and isolated, seriously damaged by accusations of political interference that had long been levelled against it both in Canada and abroad. These accusations would be skilfully exploited by a Liberal party that, in its rapid rise to power, was endeavouring to accommodate the demands of the country’s Anglo-Protestant majority, without having to deal with a church deemed difficult and intransigent. The heightened tension caused an ethnic polarization that increasingly induced Irish Catholics to identify with Anglo-Protestants rather than with their co-religionists. For its part, the Holy See blamed the French Canadian church for mixing religion, politics, and ethnic interests, and for hindering the conversion of North America, a goal it considered at last achievable because of the large numbers of Catholic immigrants. It was in these circumstances that a prolonged drama began to unfold in 1896, on the eve of a federal election. 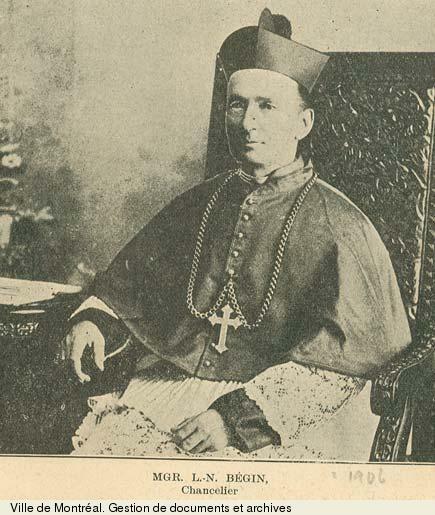 Bégin wrote a collective pastoral letter from the bishops of the province of Quebec requiring voters, as a matter of conscience, to cast their ballots for candidates who formally undertook to support a federal law reinstating the confessional school system that had been abolished in Manitoba in 1890 [see Thomas Greenway*]. This move did not have the expected effect, since Wilfrid Laurier*, the Liberal leader, who favoured an amicable accord with the government of Manitoba, came to power on 23 June 1896. A few months later, Bégin described the Laurier–Greenway agreement reached between the new prime minister and his Manitoban counterpart as a “shameful treaty” and “an absolutely immoral act.” “There was no need to spend so much time pretending to negotiate in Winnipeg in order to arrive at this minuscule compromise,” he declared on 3 Jan. 1897 in a letter to Miecislaus Cardinal Ledóchowsky. The coadjutor now considered that the church should try a new approach to get the debate on the right track – constitutional protection for minority rights. Meanwhile, the Liberals, believing themselves victims of undue clerical interference, persuaded the Holy See to send Rafael Merry del Val on a special mission to Canada in March 1897. Like Taschereau in the time of Smeulders, Bégin sought to limit the apostolic delegate’s efforts by going to Rome to plead his case directly. He returned empty-handed, however. Before leaving the Eternal City, he appointed Dominique-Ceslas Gonthier*, a Dominican, as his agent in Rome and thus managed to obtain an advance copy of the report that Merry del Val submitted to the Holy See in September. In a document setting out his observations, the archbishop rejected the report’s claims that the actions of the clergy were dictated by a partisan spirit and ethnocentrism. He even went so far as to defend Laflèche, his erstwhile sworn enemy, who had denounced Laurier’s “sunny ways” from the pulpit during the election campaign. Bégin accused the delegate of letting himself be manipulated by the “active and leading part” of the Liberal party, which was capable of “every kind of deceit and all the treachery,” and of brushing aside the French Canadian episcopacy, though it constituted at least two-thirds of the Catholic hierarchy in Canada. 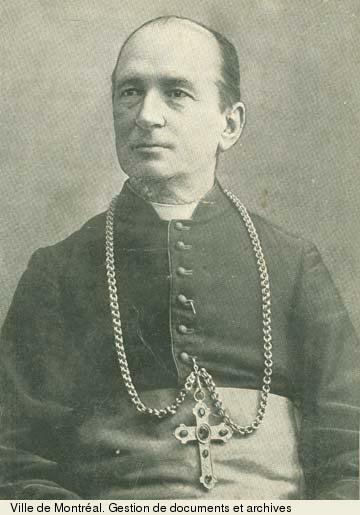 Despite this harsh criticism, the encyclical Affari vos, which was published by Leo XIII at the end of 1897 to deal with the school crisis, reflected the influence of the delegate rather than that of the archbishop, even though Bégin had written a first draft of it. While declaring that the Laurier–Greenway agreement was “defective, imperfect, inadequate,” the pope called on Catholics to work for its improvement. After consulting Archbishop Paul Bruchési* of Montreal, Bégin issued a pastoral letter longer than the encyclical which recapitulated the ideas in his draft that were not included in the papal text. He emphasized the need for Catholics to remain united around their religious leaders so that the confessional school system would be fully restored in Manitoba. Privately, the archbishop of Quebec opined that the prospect held out in the encyclical of a gradual improvement in the Laurier–Greenway agreement was an idle fantasy, given the fierce opposition of the political forces in Manitoba. He confided to Adélard Langevin* on 6 Dec. 1898 that the agreement was nothing but a “house of cards that the slightest breath of Protestant fanaticism would soon be enough to topple.” The Holy See, for its part, fearing that the bishops might hinder the much sought-after reform of the accord, forbade them to speak out. Bégin’s scepticism deepened in August 1899 when Rome, at the intense urging of Laurier, established a permanent apostolic delegation in Canada, with Diomede Falconio as the first incumbent. 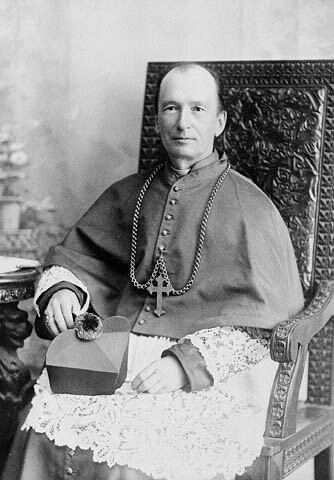 The archbishop of Quebec wrote to Cardinal Ledóchowsky on 19 Jan. 1898 that he suspected the prime minister of wanting to “cast discredit on the episcopate and convince the faithful that a Delegate has become necessary to keep it under control.” Although in favour of the delegation in principle, Bégin thought it should have been the culmination of a process through which the bishops of Canada worked together to establish a plenary council of the Canadian church as a first step. The second apostolic delegate, Donato Sbarretti y Tazza, who was appointed in December 1902, ardently supported the convening of a council, but the idea now left Bégin rather cold. This body would, in Bégin’s view, simply legitimize the delegation’s excessively conciliatory positions in regard to federal policies on minorities and Sbarretti’s ambition to replace the French Canadian episcopacy as the effective head of the Canadian church. The two men were thus at daggers drawn. 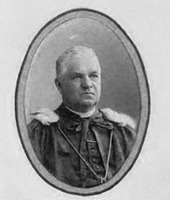 Bégin would succeed in having his candidate, Paul-Eugène Roy, named auxiliary bishop of Quebec in 1908 despite the opposition of Sbarretti, who considered him hostile towards the delegation. Sbarretti would, however, get the better of Bégin on the matter of the council, which was held at Quebec under the delegate’s chairmanship in 1909. While the archbishop of Quebec seemed to have the ear of the Sacred Congregation of Propaganda, Sbarretti had contacts at the secretariat of state, which since 1903 had been headed by Cardinal Merry del Val, who was still keenly interested in Canadian affairs. When, as a result of administrative reforms adopted by Rome, the Canadian dioceses were removed from Propaganda’s area of responsibility in 1908, Bégin lost a valuable source of support. This change did not, however, prevent him from receiving his cardinal’s hat on 25 May 1914, at the same time as his former classmate the future Pope Benedict XV. Ethnic hostilities intensified within the Canadian church, as was shown in the address given by Archbishop Francis Alphonsus Bourne of Westminster to the 1910 International Eucharistic Congress in Montreal. That year, Bégin resigned from the board of governors of the Catholic Church Extension Society, much to the displeasure of Archbishop Fergus Patrick McEvay* of Toronto, who was its chancellor. 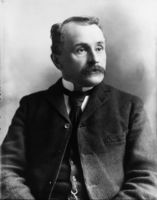 The organization, which was dedicated to helping aboriginal people and immigrants, was headed by Alfred Edward Burke, who staunchly supported British imperialism and assimilation. The following year, Bégin set up a parallel body at Quebec, the Œuvre Protectrice des Immigrants Catholiques, putting Abbé Philippe Casgrain in charge. Furthermore, when the newly chosen bishop of London, Michael Francis Fallon*, took up arms against members of his clergy and flock whom he described as nationalists because they supported the regular use of French, Bégin encouraged them to complain to Rome. In subsequent years, he argued vainly in favour of dividing the diocese of London so that a French-speaking one could be erected in Windsor and Fallon could be assigned to an English-speaking one. The Canadian church went through the worst crisis of its history, when the Ontario government passed Regulation 17 in 1912 [see Sir James Pliny Whitney*]. 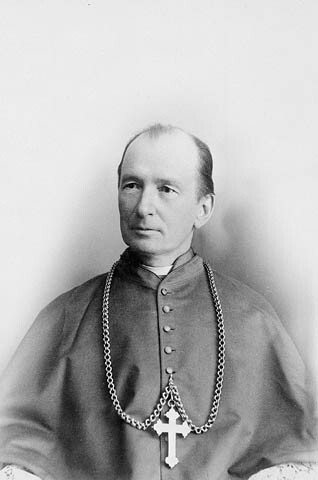 Although the Catholic bishops of Ontario supported Fallon’s initiatives – calling for an end to bilingual schools – the French Canadian episcopate stood behind Bégin and sought the intervention of Benedict XV and the federal government in this matter. Bégin publicly encouraged Franco-Ontarian pupils to defy the law, which he considered was unjust, and he legitimized the involvement of the Quebec provincial government in the dispute. The Holy See adopted a position reminiscent of the one it had taken some 20 years earlier with regard to Manitoba. The pontifical letters Commissio divinitus (1916) and E litteris apostolicis (1918) reflected the influence of the apostolic delegate Pellegrino Francesco Stagni, who rejected the idea that language was the guardian of the faith, a claim endorsed by the Quebec episcopate. While supporting the right of Franco-Ontarians to have their language taught at school, the Holy See insisted that pupils acquire an adequate knowledge of English. The second letter, however, confirmed that French Canadians should “desire and seek to obtain some broader concessions.” Although Bégin was satisfied with this position, the fact remains that Rome’s judgement on the French Canadian episcopate, its positions, and its actions was severe and all-encompassing. The apostolic delegate, for his part, felt fully justified when the highest tribunal in the British empire, the Judicial Committee of the Privy Council, on 2 Nov. 1916 upheld the constitutionality of Regulation 17. In the more relaxed climate that followed the interventions from Rome and the ruling from London, the Canadian archbishops agreed on a proposal that would create in Ontario a Roman Catholic school system in which Franco-Ontarian pupils would have access to a bilingual education. Throughout these years of sharp ethnic confrontation, the archbishop of Quebec may have overestimated the rights granted to minorities by the constitution. Like Bishop Bourget before him, he was, however, guided by a clear and simple idea of the place of French Canadians in confederation. 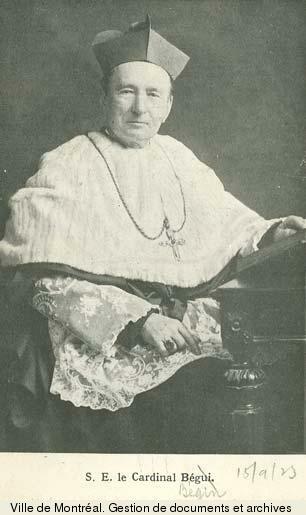 “Far from being considered a conquered people,” he told Cardinal Gotti on 2 June 1907, “we possess all the prerogatives of sovereignty.” While Bégin was not in a position to appreciate the long-term factors that led to the erosion of a minority ethnic group’s language, he knew perfectly well that the French Canadian bishops were better able than their English-speaking counterparts to foster short-term cultural retention among French Canadian minorities and European immigrants. As a prominent participant in the protest movement in favour of minority rights, Bégin probably saw the war as a good opportunity to display the church’s unshakeable loyalty to the British cause. The collective pastoral letter issued by the bishops of the ecclesiastical provinces of Quebec, Montreal, and Ottawa in September 1914 included moral support for Canadian participation in the conflict, and the circular Bégin sent out to the clergy in January 1917 “on the subject of the National Service questionnaire” ordered them to advise their “parishioners to reply conscientiously to the questions asked, so as to comply with the wishes of the civil authority.” On the other hand, Bégin considered that the Military Service Act, which was passed in July, went beyond Canada’s obligations to Great Britain and reneged on the government’s promise to the Quebec bishops not to resort to conscription. When a riot broke out at Quebec on Easter Monday 1918, after compulsory service was put into effect [see François-Louis Lessard; Georges Demeule*], Bégin flatly condemned the violence. At the same time, he found himself compelled to put pressure on the federal government to grant exemption to young ecclesiastics not yet ordained. After the struggle for minority rights, the social question was the other major theme of Bégin’s episcopate. He was not opposed in principle to industrialization and urbanization, but he believed that the mass culture they had engendered elsewhere, especially in the United States, threatened French Canadian culture and the Catholic faith. In the face of this mass culture promoted by the press, theatre, novels, and department store catalogues, the church had to provide leadership in order to ensure the cohesion of society. To this end, Bégin erected more than 60 new parishes in his archdiocese and established about 30 religious communities at Quebec. Some of these were contemplative orders, others were active in pastoral work, teaching, missions, and social and devotional causes. He often issued instructions to the people of his diocese, banning reading material and theatrical performances that he considered contrary to Catholic morality. He also exploited the popularity of temperance campaigns at the beginning of the 20th century to promote the role of the clergy as leaders. He brought pressure to bear on the various levels of government to prohibit the excessive use of alcohol. In the 1910s, under the sway of his auxiliary, Bishop Roy, who was leading a veritable crusade in favour of temperance, he even went so far as to advocate total abstinence. In the archbishop’s eyes, however, it was not enough simply to instil Christian values. The church had to create temporal institutions as well. Bégin encouraged his clergy to take an active part in setting up producers’ cooperatives, consumers’ cooperatives, and credit unions, thereby creating bonds of social and national solidarity under the sponsorship of the church. He was also a precursor of Catholic trade unionism. 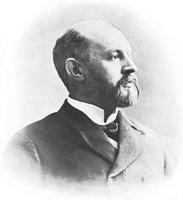 He earned this reputation thanks to the success of his efforts as a mediator in the dispute between employers and footwear workers at Quebec late in 1900 [see Gaudiose Hébert]. In the ruling he handed down as arbitrator in January 1901, the archbishop urged the unions to delete from their constitutions certain sections he considered too hostile to employers, and to agree to have a chaplain with voting rights at their meetings. Although some union leaders later denounced the paternalism of the agreement and the church’s willingness to involve itself in purely secular matters, the gains achieved should not be underestimated: union recognition in an industry marked by discord and opposition to any form of labour organization, as well as the establishment of a mechanism for settling industrial disputes. 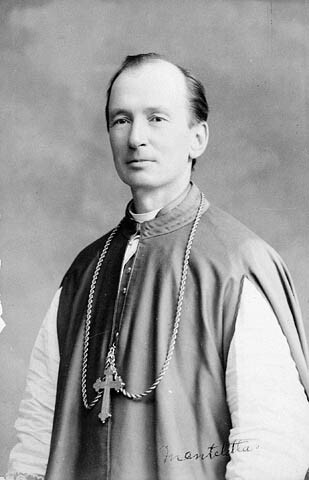 Through a pastoral letter dated 31 March 1907, Bégin reorganized the religious, national, social, and intellectual associations of the archdiocese into a central body known as the Action Sociale Catholique, of which Roy became the director. At the same time he created the Œuvre de la Presse Catholique, which led to the launching on 21 December at Quebec of L’Action sociale (which would become L’Action catholique), a daily newspaper founded jointly by Bégin, Roy, Abbé Stanislas-Alfred Lortie*, and Adjutor Rivard*, a lawyer. At a time when newspapers were either the official organs of the two major political parties or the pre-eminent dispensers of mass culture, L’Action sociale stood out as a vehicle of a Catholic urban-industrial counter-culture based on the teachings of the church. The cardinal’s advancing years forced him increasingly to surrender diocesan administration to Roy, who had become his coadjutor with right of succession in 1920. In 1924, because of Roy’s poor health, Rome gave him a second auxiliary, Joseph-Alfred Langlois. The following year, a few weeks after celebrating the 60th anniversary of his ordination, Bégin suffered an attack of paralysis and died. An impressive funeral was held on 25 July in the basilica of Notre-Dame. A tall man with an air of distinction, Bégin retained the modest ways of his humble beginnings. Despite the honours he accumulated in the course of his life, he was always a man of good sense and moderation. For this reason, he found it difficult to endure the haughtiness of someone like Merry del Val. While he recognized that the French Canadian hierarchy was not without its faults, he knew that “many European eagles become quite ordinary birds when we get a closer look at them,” as he stated in his memorandum on Merry del Val’s report. His ready smile, his gentle and lively eyes, his ease in speaking, and his courtesy drew people to him. He had no difficulty, therefore, in recruiting experienced helpers for the many charitable endeavours he sponsored. Despite his advanced studies, published works, and membership in prestigious cultural organizations, Bégin did little or no reading because he was overburdened with his administrative responsibilities. Louis-Nazaire Bégin was first and foremost Rome’s man. At the age of 82 he made the last of more than 30 journeys to the Eternal City. It was there that he found his inspiration, his religiosity, his doctrine, his social and intellectual models. The most rigid positions taken by Rome, such as the one against modernism in 1907, did not shake this churchman’s orthodox beliefs. He took pride also in the doctrinal conformity of his clergy. In 1915, in order to get closer to canonical ideals, he revived the metropolitan chapter of Quebec, which had gradually faded away soon after the conquest. Although he never took part in a conclave, arriving in Rome too late in 1914 and 1922, he was truly loyal to the papacy. Yet he had to face the bitter reality that the Holy See did not share his vision of the place of French Canadians in confederation and in the Canadian church. Nevertheless, by tirelessly defending the rights of minorities and by helping build a public Catholic culture in the province of Quebec (the only one north of the Rio Grande), Bégin proved a leading figure in French Canada. The most complete bibliography of the writings of Louis-Nazaire Bégin can be found in Simon Héroux, “Les relations entre l’Église et l’État d’après le cardinal Louis-Nazaire Bégin, 1840–1925” (thèse de phd, univ. d’Ottawa, 1973). Several of Bégin’s publications have been preserved on microfiche and are listed in CIHM, Reg. ANQ-Q, CE301-S19, 11 janv. 1840. Arch. de l’Archidiocèse de Québec, 31-17A (papiers cardinal L.-N. Bégin). Arch. de l’Évêché de Chicoutimi (Chicoutimi, Qué. ), Reg., sér.B, actes, vol.I (1878–1900): 377–79. Archivio della Propaganda Fide (Rome), Acta, vols.247, 253; Nuova serie, vols.120, 240–42, 462; Scritture originali riferite nelle Congregazioni generali, vols.1030, 1040; Scritture riferite nei Congressi, America settentrionale, vols.14, 26, 28. Archivio Segreto Vaticano (Rome), Delegazione apostolica degli Stati Uniti, VI. MCQ-FSQ, Séminaire 71, no.127; Séminaire 88, no.19A; SME, 10 févr. 1879; SME 1/MS-34.2, 24 nov. 1875, 28, 31 janv. 1878; MS-34.3, 16 janv., 8 févr. 1879, 23 nov. 1880; SME 9/72/100; 9/105/47; 13/33; 13/674: 43; 13/678. L’Action catholique (Québec), 20 juill. 1925, 7 janv. 1940, suppl. L’Événement, 23 avril 1898. “Mgr Bégin, second évêque de Chicoutimi,” La Semaine religieuse de Québec, 25 oct. 1888. 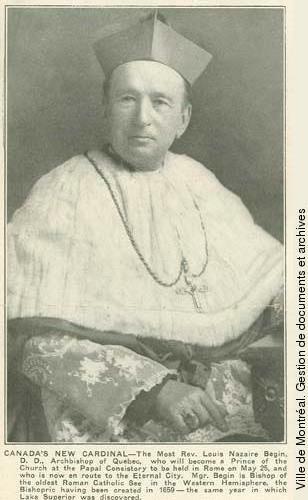 André Pillet, “Son Éminence le cardinal L.-N. Bégin, archevêque de Québec,” La Semaine religieuse de Québec, 17 sept. 1925. Almanach de l’Action sociale catholique (Québec), 10 (1926): 12–15. “Le cardinal Bégin,” RSC, Trans., 3rd ser., 20 (1926), proc. : v–x. Robert Choquette, Language and religion: a history of English-French conflict in Ontario (Ottawa, 1975). P. [E.] Crunican, Priests and politicians: Manitoba schools and the election of 1896 (Toronto and Buffalo, N.Y., 1974). Histoire du catholicisme québécois, sous la dir. de Nive Voisine (2 tomes en 4v. parus, Montréal, 1984– ), tome 2, vol.2 (Philippe Sylvain et Nive Voisine, Les XVIIIe et XIXe siècles: réveil et consolidation (1840–1898), 1991); tome 3, vol.1 (Jean Hamelin et Nicole Gagnon, Le XXe siècle: 1898–1940, 1984). André Lavallée, Québec contre Montréal; la querelle universitaire, 1876–1891 (Montréal, 1974). M. G. McGowan, “‘Religious duties and patriotic endeavours’: the Catholic Church Extension Society, French Canada and the prairie west, 1908–1916,” CCHA, Hist. studies, 51 (1984): 107–19. Martin Pâquet, “Marquage identitaire et pastorale catholique: l’Œuvre protectrice des immigrants catholiques, 1912–1930,” in Constructions identitaires et pratiques sociales, ed. J.-P. Wallot et al. (Ottawa, 2002). Marius Paré, L’Église au diocèse de Chicoutimi (3v. parus, Chicoutimi, 1983– ), 2 (1888–1892, 1987). Roberto Perin, “French-speaking Canada from 1840,” in A concise history of Christianity in Canada, ed. Terrence Murphy (Toronto, 1996), 190–260; Rome in Canada: the Vatican and Canadian affairs in the late Victorian age (Toronto, 1990). Giovanni Pizzorusso, “Donato Sbarretti, delegato apostolico a Ottawa, e la difficile organizzazione del Concilio plenario canadese (1909),” Annali accademici canadesi (Ottawa), 6 (1990): 77–88; “Un diplomate du Vatican en Amérique: Donato Sbarretti à Washington, La Havane et Ottawa (1893–1910),” Annali accademici canadesi, 9 (1993): 5–18. Jacques Rouillard, Les syndicats nationaux au Québec, de 1900 à 1930 (Québec, 1979). Robert Rumilly, Mgr Laflèche et son temps (Montréal, ). Matteo Sanfilippo, “Diomede Falconio et l’Église catholique en Amérique du Nord,” Canadian Studies Rev. (Fasano, Italy), 5 (1992): 43–47; “Roman archives as a source for the history of Canadian ethnic groups,” CCHA, Hist. studies, 60 (1993–94): 83–101. Pierre Savard, “L’Italia nella cultura franco-canadese dell’Ottocento,” in Canadiana: problemi di storia canadese, ed. Luca Codignola (Venice, 1983), 91–106; “Le journal de l’abbé Benjamin Pâquet, étudiant à Rome, 1863–1866,” Culture (Québec), 26 (1965): 64–83. André Simard, Les évêques et les prêtres séculiers au diocèse de Chicoutimi, 1878–1968; notices biographiques (Chicoutimi, 1969). 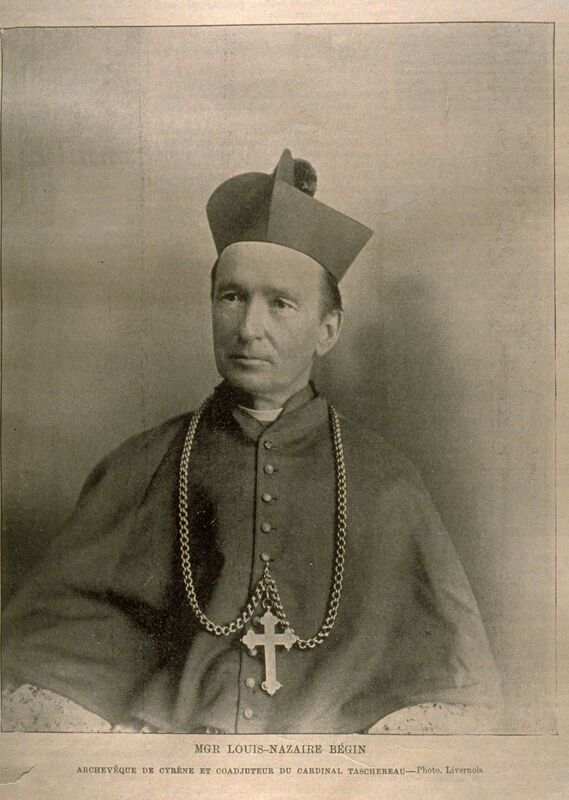 Donald Tremblay, “Mgr Pellegrino Francesco Stagni, o.s.m., et l’Église canadienne, 1910–1918” (thèse de phd, univ. Laval, Québec, 1995). Roberto Perin, “BÉGIN, LOUIS-NAZAIRE,” in Dictionary of Canadian Biography, vol. 15, University of Toronto/Université Laval, 2003–, accessed April 24, 2019, http://www.biographi.ca/en/bio/begin_louis_nazaire_15E.html.